Second Annual Malt Shop Memories Cruise Announced! Sixthman and Time Life are proud to announce the second annual Malt Shop Memories Cruise, sailing from Port Canaveral, Florida, to Nassau, Bahamas, onboard the Carnival Sensation. The cruise leaves on Sunday, May 8, 2011, and returns on Thursday, May 12. Performers include Chubby Checker, Little Anthony & the Imperials, Shirley Alston Reeves – Original Lead of the Shirelles, The Crystals, The Original Drifters, The Tymes, and more. Based on Time Life’s acclaimed Malt Shop Memories box set, the cruise brings the sounds of the 50s and 60s to life, with live performances from the best acts from the Malt Shop era. Along with live shows, guests will enjoy onboard activities such as dance contests and lessons, theme nights, and more. Chubby Checker joins the Malt Shop Memories Cruise just in time for the Twist’s 50th birthday. Shirley Alston Reeves, co-founder and original lead singer of The Shirelles, makes a great addition to the lineup, as do The Crystals, who had several top ten hits such as “He’s a Rebel” and “Da Doo Ron Ron.” Sixthman and Time Life are also looking forward to welcoming Philly group The Tymes who had a hit with “So Much in Love,” as well as The Skyliners whose “Since I Don’t Have You” topped charts in the fifties. “The Geator with the Heater” Jerry Blavat will again emcee the cruise, and several of the artists from 2010’s cruise will return, including Little Anthony & The Imperials, The Original Drifters, and a capella doo wop groups The Del Rays, The Devotions, The Fireflys, and award-winning Elvis Tribute Artist Gino Monopoli. 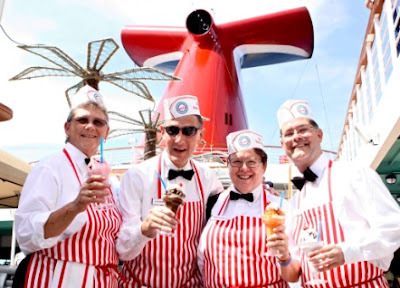 The first ever Malt Shop Memories cruise took place in May of 2010; guests reported feeling transported back in time to simpler days with the best music in the world. They forged new friendships and intermingled with the likes of Frankie Avalon, Little Anthony, Lou Christie, Lesley Gore, “The Geator with the Heater” Jerry Blavat, and more. Activities included hula-hoop contests, a sock hop, wine tastings, bingo, and more. Guests can book their vacation of a lifetime at maltshopcruise.com. Prices start at $799 and include entertainment, meals, onboard activities, and more.